It feels like Westminster is tumbling towards a political crisis without modern precedent. On Tuesday 11 December, the House of Commons will conclude five days of debate with a vote on a government motion to approve the EU withdrawal agreement and accompanying political declaration. The terms of the UK’s departure from the EU. But at the moment, it looks as if Theresa May faces an incredibly hard job getting it passed. She leads a government with a working majority of just 13. Only seven Tory rebels are needed to defeat it. But according to the latest number-crunching by BBC researchers, 81 Tory MPs have said they object to the deal Mrs May hopes to sign off with EU leaders on Sunday. With Labour, the Liberal Democrats, the SNP and even perhaps the DUP set to vote against the motion too, the withdrawal agreement looks set to be torpedoed in the Commons. Between now and then Theresa May will exhaustively insist the deal is in the national interest and the only way of ensuring Brexit happens. But if the withdrawal agreement is defeated, what happens then? It is the burning question in Westminster and everyone has an opinion. The new work and pensions secretary Amber Rudd said the House of Commons “will stop no deal”. Shadow Chancellor John McDonnell said it was “very difficult to predict at the moment what the final outcome will be”. 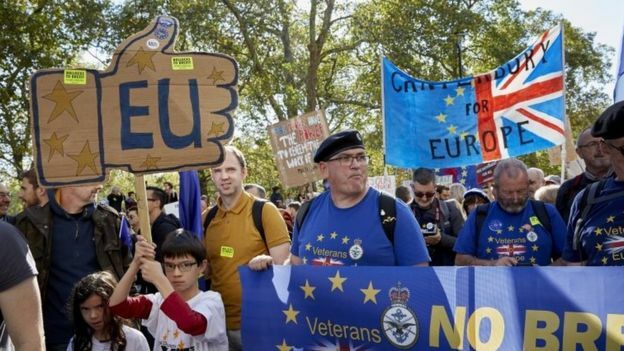 And the former Tory cabinet minister (and now advocate for another referendum) Justine Greening said there was “no majority for any route forward”. Which may be true but doesn’t solve the huge political problem MPs will face if the deal is chucked out. Crucially, the default position in that scenario would be for the UK to leave without a deal. Under both EU law and the UK’s Withdrawal Act, Brexit day is chiselled into the diary for 11pm on 29 March, 2019. That’s when the EU Treaties will stop applying to the UK. If Parliament rejects the deal, the same Withdrawal Act sets out what the government must do next. Ministers would have up to 21 days to make a statement to the Commons on “how it proposes to proceed”. The government would then have a further seven days to move a motion in the Commons, allowing MPs to express their view on the government’s course of action. Crucially though, this would not be opportunity for MPs to throw a road-block in the way of a no-deal Brexit if that’s what the government wanted to happen. The motion would probably not be amendable, nor would its defeat carry the legal force to stop the UK leaving without a deal next March. Instead, the government would have to put new legislation before Parliament and secure the approval of MPs if it did not want the UK to leave without a deal. But in addition to the rigid legal position there would be the frenzied political reality. The maximum three week window between the government’s deal being defeated and the requirement on ministers to propose a way forward would see several alternative scenarios come into play. The prime minister could make a second attempt at getting the withdrawal deal through the Commons. Sir David Natzler said, in procedural terms, that would be possible. “The words might be the same but the underlying reality would be self-evidently be different”, Sir David said. Brussels might be persuaded to tweak the political declaration on the future relationship to meet the concerns of MPs. But with the Commons so fractured in its various objections would that make much difference? More significant could be panic on the markets and that might change minds in parliament. Alternatively, MPs might suddenly shift in large numbers towards the idea of another referendum to break the Parliamentary impasse and open the possibility of stopping Brexit. At the moment, about eight Tory and 44 Labour MPs have publicly committed to another referendum. The Labour leadership has said all options should remain on the table (including another referendum) and the SNP and Lib Dems say there should be one too. However, a second referendum can only happen if the government brings forward legislation to hold one and a majority in the Commons supports it. Theresa May is dead set against another referendum and it’s hard to see an alternative Tory leader picking up that baton. But perhaps there will be a general election instead? That is Labour’s preferred outcome to the deal being rejected. There are two routes to a general election through the Fixed Term Parliament Act and both involve motions of confidence in the Commons. That will be the other critical factor at play. Unless the government asks for an extension to the negotiating period (and Number 10 has ruled that out) the time for parliament and the government to agree a way forward is incredibly tight. Another idea that has been floated is a “negotiated no deal” in the which the UK would ask the EU for a (paid) one year extension of membership before leaving on World Trade Organisation terms. Some Brexiteers might like the idea but it’s hard to see Parliament supporting such a move – with or without an explicit vote. Because Parliament will have to come to a view. As Maddy Thimont Jack, from the Institute for Government think tank says: “We do have Parliamentary sovereignty and there are clear ways for Parliament to express a very strong political view. Theresa May might have neutralised the chance of defeat in the Commons if she had found a Parliamentary consensus for the Brexit she planned to negotiate right at the start of the process. Instead, she faces three fraught weeks and a vote that will define the country’s future for many years. Right now, it looks like the government’s deal cannot get through the Commons. But the mood in Westminster could shift quickly in the current pandemonium.